Coffee aficionados, both locals and foreigners, were recently satisfied quite to their heart's content at the taste of hundreds of different kinds of coffee brands exhibited at Coex in Seoul for four days in a row. Hundreds of local and international coffee brands and related equipments were introduced at "Coffee Show 2015" held at Coex in Seoul on Nov. 12-15, 2015. A total of 560 coffee brands and coffee-related companies from 35 countries took part in "The 14th Seoul Coffee Show." Over 2000 boothes were set up for the Asia's largest coffee show. Among the coffee-strong Latin American countries was Bolivia, which exhibited its highland coffee brands at its booth on the third floor of Coex building in Seoul's Samseong-dong area. 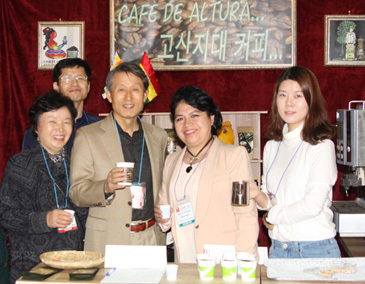 Bolivian Ambassador Guadalupe Palomeque De Taboada (2nd from right) poses with her staff and her guests at "Coffee Show 2015" held at Coex in Seoul on Nov. 12-15, 2015. 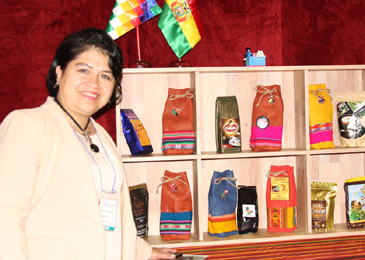 During the four-day coffee festival Bolivian Ambassador Guadalupe Palomeque De Taboada appeared in person at its booth. A host of visitors visited the Bolivian booth and tasted Bolivian coffee from the Yungas region, where most of the coffee plants are located. The Bolivian coffee brands produced organically at this region boast of top quality due to its altitude of between 800 to 2,300 meters above the sea level, the Bolivian envoy said. Bolivian coffee is well acclimatized in Yungas, as the coffee grows almost spontaneously, she explained. She added that Bolivian coffee is provided by the Federation of Coffee Growers Exporting Bolivia (FECABEB), a cooperative that gets together all coffee producers from the department of La Paz. Bolivia's participation in the "Coffee Show 2015" coincided with the "Cup of Coffee Quality Presidential Evo Morales National Tournament 2015," held simultaneously in Bolivia. At the Bolivian event international coffee tasters were present from several countries including South Korea. According to the en voy the promotion of Bolivian coffee was supported strongly by its government normally via many agencies within the Ministry of Rural Development and Land and the Ministry of Foreign Affairs through the Embassy of Bolivia in Korea. She noted that there are more than 37,000 coffee producers in her country, adding that the government of Bolivia is exerting its utmost to make Bolivia seen as a producer of high quality coffee.